Private school parents across Australia are spending a higher percentage of their family budget on school fees than mortgage payments. Our latest research of 1,600 families with children attending non-government schools found that on average, school fees took up 35% of their net family income. As a comparison, the average mortgage payment takes up 25.1% of household disposable income. While much of the focus in the media has been on expenses like the mortgage and energy bills, families are certainly feeling the pinch on the hip pocket with the rising cost of school fees. 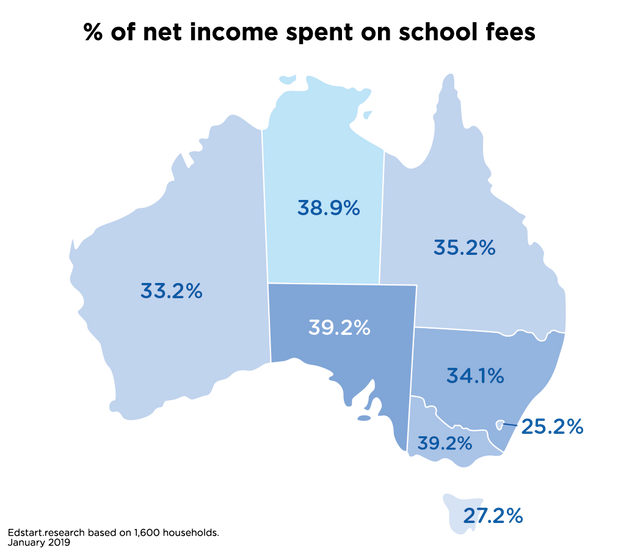 Victoria and South Australia were the states with the highest percentage, while families in the ACT and Tasmania spent less of their income on school fees. We’ve heard many stories highlighting the sacrifices parents are making to ensure school fees are covered. From those who have sold their home and gone back to renting, to those where both parents have more than one job. Some families have had to look at changing schools. We believe that changing schools part way through is not good for anyone. The benefit of Edstart is that we ensure every child can graduate from their intended school. Finance shouldn't get in the way of a education - the goal is to make the cost of education more manageable for families. That’s why we developed a fit-for-purpose service to support families. Just like what a mortgage is to a house, a lease for a car, Edstart is the equivalent for education. It's all about making it a manageable expense by enabling parents to make small regular payments, rather than having to pay fees in one lump sum. Edstart was founded by a passionate team of Australian education and finance specialists who believe in the power of education and are committed to building a solution to support access to learning. To see how we can help with your school fees and receive tailored funding options, visit our main website.